When it comes to the practicalities of Classical Dressage, learning to do anything of real and lasting value requires commitment. Riding is a simple science but as with other sciences is ruled by certain principles and laws of Nature. To learn to apply these to a physical activity which involves another living being is especially complicated. Before we even begin, not only do we need to discover what forces are at work in us, we also need to appreciate those that govern the horse. 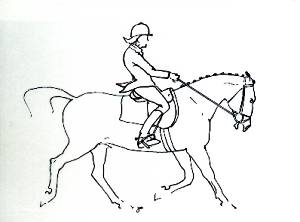 This makes riding very much more exacting that a sport which involves an inanimate object, such as a golf club, a tennis racquet or a pair of skates. In terms of mastering technique, sailing a boat is probably the closest to riding. A horse can be unpredictable, so can the sea, so can the wind. The principles of balance involved in setting the boat up to go forward is not unlike that of setting the horse up. 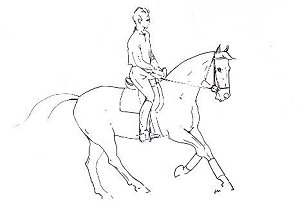 Both need elevation in front - prow or forehand; both need strength and push from behind - the stern deep in the water, the hocks flexed and engaged under the horse. Whether handling the rudder or the reins, the operator needs to develop acute and specific sensitivity to balance, all round awareness and above all a sense of timing and feel for the moment. In both activities, elements such as balance or weight control, forward thrust, centrifugal force, sideways pressures are all important factors. In riding there is the horse's anatomy to consider as well as our own. The list of things to understand can be endless - it can take years, a lifetime thoroughly to understand and put into practice. Once we begin to realise this, we can either embrace the future with open arms and start the long walk towards the light, or retreat back into uncertainty and obscurity. Believe me, there are many riders working out there in total darkness! Unfortunately, the system does not help and there is a world shortage of true experts with the gift of revealing the truth and passing on that knowledge to others. Others simply see no reason to share. Let's face it - anyone can learn to sit on a horse relatively quickly and given a little more time most people can learn to dominate it. However to ride - used here in its specific sense - is altogether something else. Riding implies a partnership; and like any partnership or marriage of minds, there can be a great deal of trial and error - unless one finds a very good teacher to help smooth the way. Time nowadays is short and for me it has been a challenge to help people find those answers that eluded me when I first started riding but which I was then lucky enough to discover by being in the right place at the right time. However, why should it have to be like this? 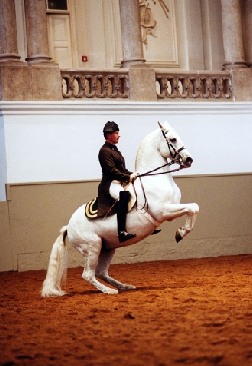 Quite honestly, I see no reason why people should struggle in the dark even at the beginning of training which is why I have dedicated the last 40 years to trying to make Classical Dressage accessible to all.